When I founded Bhasha Andolan, Orissa on my own method of ‘Silent Black Flag March, I had no reason to apprehend that a time would come when the fellow I had trusted most – Pabitra Maharatha – would indulge in financial offenses including forgery and misappropriation as well as criminal breach of trust and would embezzle several lakhs of rupees that the movement had generated for its campaign funds. It was also not foreseen that the other man in the three-member-team of leadership Pradyumna Satpathy would act to cover up the embezzlement. On coming to know of the serious offense, as the founder of the movement, I wanted Maharatha to disclose details of the accounts, which he avoided. Pradyumna Satpathy came to his rescue. I had to inform the Police about the offense, as the Chairman of the movement. A rising journalist Soumyaranjan Nayak exposed the offence live in Facebook, which some media organisations also carried. The corrupt fellows made a clandestine tryst with a close colleague of the Chief Minister – Finance Minister Shashibhusan Behera – promising him to stop the campaign if Police could be made to stop taking any action on my information. Grapevines spread speculations of huge sums of money used to complete the deal with the duo. A very well-informed, sharp political analysts and Editor of Chhai in Pratijna TV, Satish Mishra while confirming this, has also observed that BJP had a secret agenda to hijack Bhasha Andolan that had become the most noteworthy movement due to the Black Flag Campaign method. But the asylum given to them by the finance minister having gone grey due to continuance of the Black Flag Campaign, the two corrupt fellows, in order to create environment to escape my allegation, have started projecting one Chakradhar Mohanta as Chairman of the movement, so that my FIR as the Chairman shall get lost in the labyrinth of counter claim over my status. Who is this Cakradhar Mohanta and why has he sided with these corrupt fellows? As I investigate into this murky matter, I find, he is a noted economic offender prosecuted by the State Vigilance Police for offence under clause (e) of sub-section (1) of Section 13 of the Prevention of Corruption Act, while holding high public office in the State of Odisha as Superintending Engineer, Irrigation Circle, Berhampur and has been charge-sheeted in Vigilance P.S. Case No. 43, Dt. 22-11-2006; and is being tried by the Special Court established under sub-section (1) of Section 3 of Special Courts Act, 2006. The prosecution is meant to confiscate his properties. As birds of the same feather fly together, he has associated himself with the embezzler of the movement fund. He is reportedly promised with settlement of the case, if he creates a confusion over my status as Chairman of the movement so that the case before the Police may be challenged on the issue of locus standi. 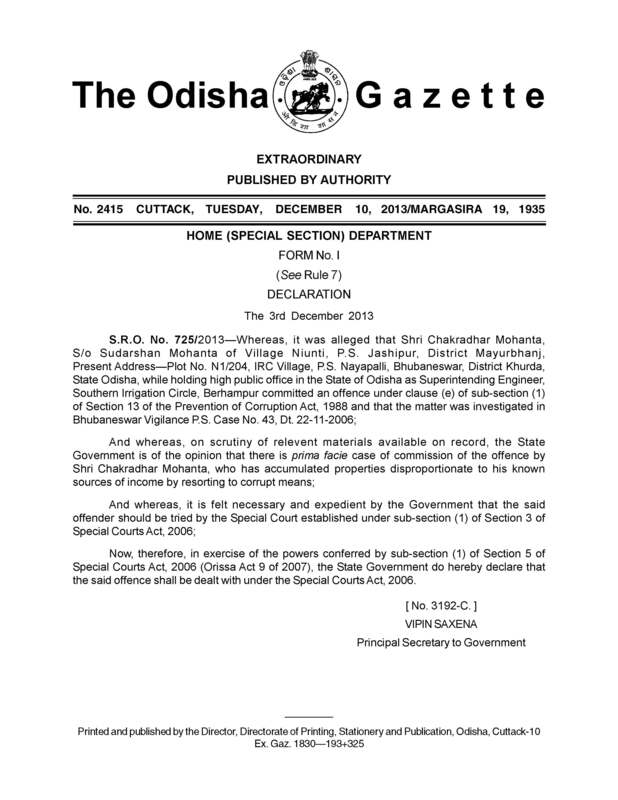 Here below id the gazette notification of his prosecution in the Special Court as per sub-section (1) of Section 5 of Special Courts Act, 2006 (Orissa Act 9 of 2007). Clearly, the unique movement for governance of Orissa in Oriya is at the crossroads.